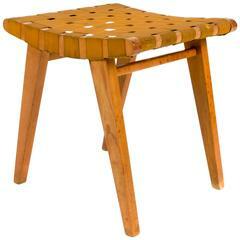 Rare and early Jens Risom stool for Knoll Associates, New York City. Simple, elegant design. 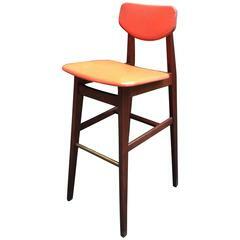 Retains original finish as well as original early oil cloth upholstered top. Also original Knoll Associates Label. 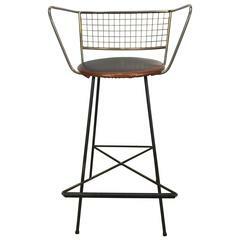 Early adjustable Industrial machinist stool, manufactured by Toledo,, Wonderful original patina color and surface. Solid carved wood top and back. 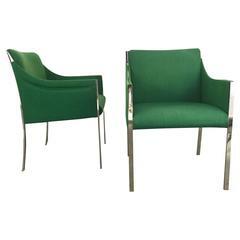 Stunning pair of lounge chairs designed by Jens Risom, stainless steel frames, superior quality, flawless welds, retains original Knoll electric green wool upholstery, stunning. Designed for Hans Knoll by Jens Risom in 1943. Basket-woven parachute straps. 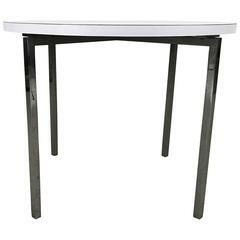 Knoll, Eero Saarinen, Knoll Associates Inc. Early low stool designed by Eero Saarinen for Knoll Associates, Madison Avenue, NYC. Early bow tie label. Original upholstery. Re-upholstery suggested. The stool doesn't swivel. 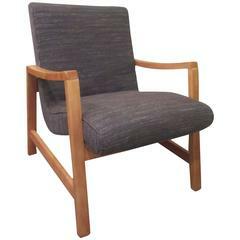 Jens Risom for Knoll Associates freshly reupholstered in a current blue/grey/cream Knoll Rivington fabric on a solid birch frame. Black and white photo is from a 1954 Knoll catalogue. 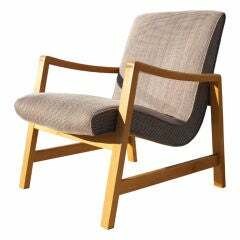 In this striking armchair by Jens Risom for Knoll a curvaceous upholstered seat floats within a strong-lined birch frame. Early production of Jens Risom signature strap lounge chair. Bears heat transfer Knoll makers mark and original straps. 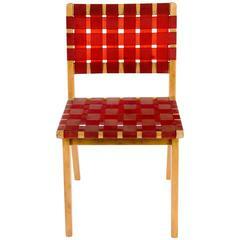 Designed for Knoll by Jens Risom in 1943. Basket-woven parachute straps.